A town of Old Castile, in the vicinity of Logroño, which was inhabited by Jews as early as the eleventh century. The Jewish congregation there was subject to the authority of the bishop of Calahorra, and by order of Alfonso X. it paid taxes either to the bishop or to the chapter. In the thirteenth century the congregation, consisting of thirty-five families, was obliged to deliver to the chapter thirteen hens three days before each Ash Wednesday; and to the bishop, whenever he visited the city, a sufficient quantity of linen for himself and his suite. The chapter, to whom belonged all fines imposed upon the Jews, occasionally had them imprisoned. The Jewish congregation of Albelda, together with that of Alfacel, was obliged to pay an annual tax of 11,648 silver maravedis. 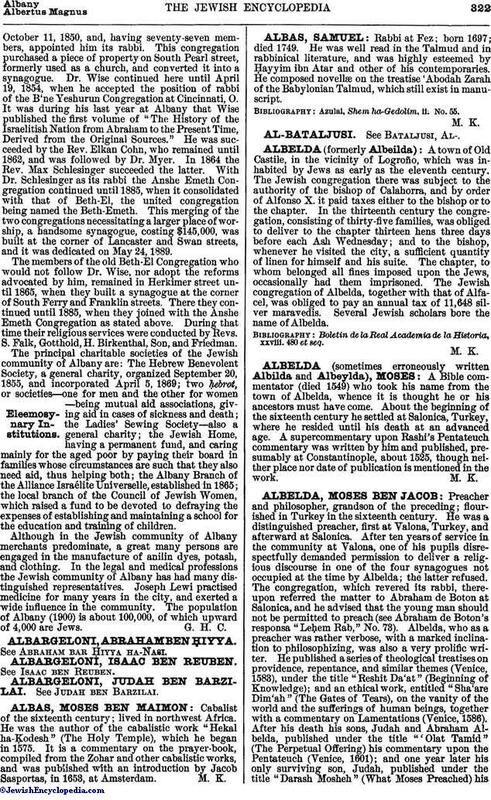 Several Jewish scholars bore the name of Albelda. Boletin de la Real Academia de la Historia, xxviii. 480 et seq.